As always I’m looking for something a little different from a photography shoot. Sure you get the head shot of the politician in the can, shoot it vertical, shoot it horizontal, but then what? What can I do to get something a little more unusual? Today I was out with Alex Salmond, First Minister of Scotland, as he opened a new digital business incubator lab in Edinburgh, Scotland. Not overly exciting sounding, but it was good. There was plenty of daylight streaming in from both sides of the room, lots of people about, some technology, and as ever the First Minister was joking and friendly, taking an interest. And I had plenty of time to photograph. Plenty of time to experiment and try for something a little different. This was the frame I like best from the shoot, maybe not the most obvious, but it could be useful sometime perhaps. Alex Salmond had been doing interviews for television in a glass box-like room, and then the TV crew stepped out, leaving the First Minister by himself, between crews and interviews. Alex Salmond, First Minister of Scotland, in Edinburgh. 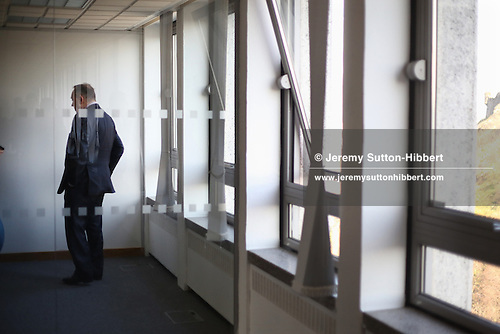 ©Jeremy Sutton-Hibbert 2014, all rights reserved. What do you think, like it? If his efforts come to naught this image will sell loads. Thanks Darren! A good way of looking at it, maybe I should get the image ready and primed to send out…!